The CBS West Coast high definition flagship facility is the first duopoly of its kind, designed to serve KCBS 2 and KCAL 9 with a shared 17,000 s.f. newsroom. 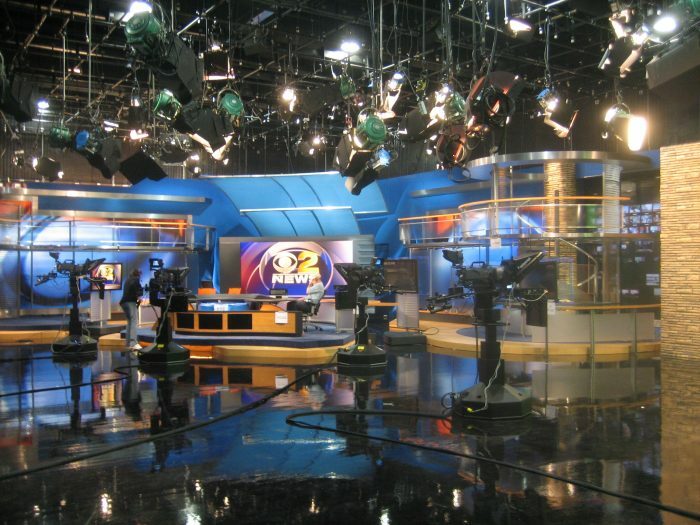 It is also home to network executives and is the network broadcast nerve center. The four-level, 212,000 s.f. building contains two 5,000 s.f. television studios with control rooms, 6,000 s.f. sports department, commissary and kitchen and 150,000 s.f. of executive and general office space. The basement level houses news van parking, the broadcast equipment center, and redundant fiber-optics and power. The technical spaces include over 4,700 s.f. of broadcast equipment, server-based video systems, and 15 microwave dishes on the roof. Over 1.4 million lineal feet of broadcast cable connects the people and equipment in this unique facility. Adjacent to the building is a 22-satellite dish farm for worldwide connectivity.